Just back from a short visit to Western North Carolina where you can find the highest mountains in the Eastern United States. I know that Virginia is a wonderful place to live and we have great hiking and beautiful mountains, but the area near Asheville really captured my heart on this visit. We stayed near Black Mountain – a cute resort town with specialty shops and a variety of restaurants that are sure to fill everyone’s palate. with 3 creek crossings like this one. We decided not to go to the top since we did not bring supplies for a longer hike. But we veered off to have a look at the waterfall. I don’t want to sound like a waterfall snob, but this one had me laughing. I think I’ve seen more action from my faucet. Still, it was a lovely day to be in the woods and we were doing what we enjoy. We ended up hiking around 4 1/2 miles which was our original intent. We did make it to Asheville later that day and were drawn to this old Woolworth’s building that has been converted to an art gallery, but kept it’s lunch counter. Asheville is a very fun artsy town which also yields some interesting restaurants, mostly emphasizing locally grown foods and local beers. The next morning we headed out to the Blue Ridge Parkway and took a short 2 1/2 mile hike to see this view. Most views on the Parkway have easy access from the road. 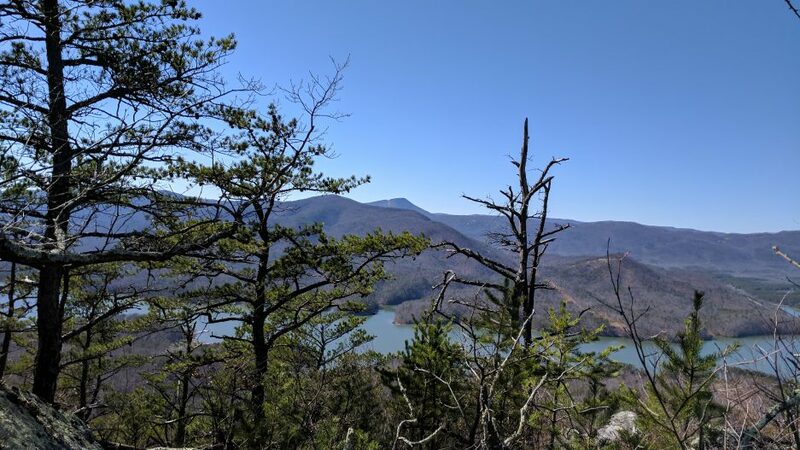 But there is a Mountains to Sea trail that runs parallel to the BRP so if you are adventurous, you can hike or bike from one end of the state to the other. It’s hard to capture the beauty of these mountains as amateur photographers, but we couldn’t resist trying. Growing up in the flat country of the Midwest, I’m still in awe of these majestic summits. I don’t think I will ever get tired of the incredible vistas provided by the Appalachian Mountains. It is certainly a beautiful spot to go hiking in! And the town of Asheville is so pretty, I love how it kept the original lunch counter – so retro it’s back in fashion 🙂 The artwork is reminiscent of the 60’s and that collection is eye catching! I’m always made happy when I hear of restaurants serving local produce – which I hope is grown in a healthy manner – and local beers too. I hope you enjoyed one or two….. Thanks Pauline, we did find a couple of local beers that we liked. The artwork was delightful, I regret that we didn’t take more pictures. Since Asheville is less than four hours from here, I feel confident we will be going back. Asheville is such a great place, and I’ve been to that art gallery. It’s a fun place to explore for sure, and I love seeing the places that I have visited through your eyes and perspective. I love that picture with the sign showing the mountains and elevation. Thanks LB, I thought about you and your trip on the BRP – wow that North Carolina is something! The gallery was really fun. I was doing pretty well, but went on three hikes in one week and am feeling it in places. I’m determined to be fit. So pretty, and Asheville is such an awesome town. It sounds/looks like a great trip! Thanks Cindy, it was fun! Also being from the Midwest, I know exactly what you mean about the Appalachian Mountains! “more action from your faucet” LOL! I’m glad you got away to such a beautiful spot. It looks breathtaking. My favorite part of traveling is finding the unique spots that you don’t see anywhere else, like that train arch or the stone entry way to the college trail. I remember the old Woolworth counters from my childhood. How clever of them to keep it in its vintage form, along with the new gallery. I agree Alys, in fact in Greensboro where my daughter lives, the Woolworth is a Civil Rights museum. It’s where Blacks had their sit-ins and they kept the counter exactly how it was. I miss those 5 and Dimes of our youth. I miss those five and dimes, too. I remember buying Christmas presents for my sister and mom there. It seems like a lifetime ago. I love that Greensboro kept the counter and turned it into a museum. How wonderfully appropriate. Let me know if you do and maybe we can plan a hike together. Black Moutnain! My hometown! Thanks for visiting! What a nice place to grow up! Are you a hiker? Because you are in beautiful country for hiking.